Subject: Re: Thank you for banking with us. .Yours In service. .
Dear: ,. . . .see attach your Fund Proof Of Ownership from Washington supreme Court/ your Drug Clearance Certificate/ Official Authorization For Release Letter From President Trump/Picture when President Trump is re-approving your $200 Million and my working id card,,. . I receive your massage and your information has forwarded it to the Wire Transfer department for immediate transferring of your $200 million into your nominated bank account or open online bank in your name and transfer but first you are to secure the needed Transfer Permit Certificate (TPC) from office of the Presidency United States of America so that United States Government will back you up with Immunity Coverage and protect you not to have any problem as soon as your $200 million hit your nominated bank account that is why you must secure the Transfer Permit Certificate (TPC . . . This is your long Inheritance Contract payment From Africa which Africa Government in power then refused to release to you since past years but thank God for Mr President Donald Trump who force Africa Government to release your $200 million to our bank here on your behalf and he also instructed us to be transferring $10 Million or $20 Million each to your account . . .We are ready to start transferring $10 Million to $20 Million Each to your nominated bank account till you received your full payment of $200 million and the first transfer must start on 1st February 2018. . hence you secure the needed Permit Certificate from the United States Government to protect your transfer as Mr President Donald J. Trump Instructed our bank here in Washington D.C United States of America . . . you are to secure the needed Transfer Permit Certificate(TPC) from Office of the Presidency United States Government which will cost you only $710.00 to enable us start your transfer and we have contacted the department in charge of the Transfer Permit Certificate(TPC) they told us that they are ready to issue the Certificate on your behalf through the help of our bank lawyer Barrister Mike Anderson who will go ad sign the certificate on your behalf with as soon as you send the fees. 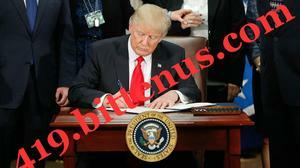 .you need to be faster in securing this certificate from Office of the Presidency United states of America so that Mr President Donald J. Trump that Approved your payment will sign the Transfer Permit Certificate (TPC) and stand with the Transfer till you successful received your full $200 million in your bank account. . . because this is the only thing that will delay your transfer as we are ready to start your transfer on 1st February 2018. . Get back to advise you how you will send the $710.00 to the department in charges officer in office of the Presidency Hence you don't have the Bank of America account needed to enable the Investor loan you the fees if you have the account with Bank of America provide it to loan you the fees. . Thank you for banking with us. .Yours In service. .